Worldwide, more than 70 billion land animals are killed for food every year. Our series of charts based on United Nations data shows the trends by type of animal. Every year, billions of animals are slaughtered by the animal agriculture industry. The practice causes suffering on a massive scale that may be difficult for people to understand. Information provided by governments and industries are often focused on metrics like the weight of meat produced or consumed. As animal advocates, however, we care mostly about individual lives. 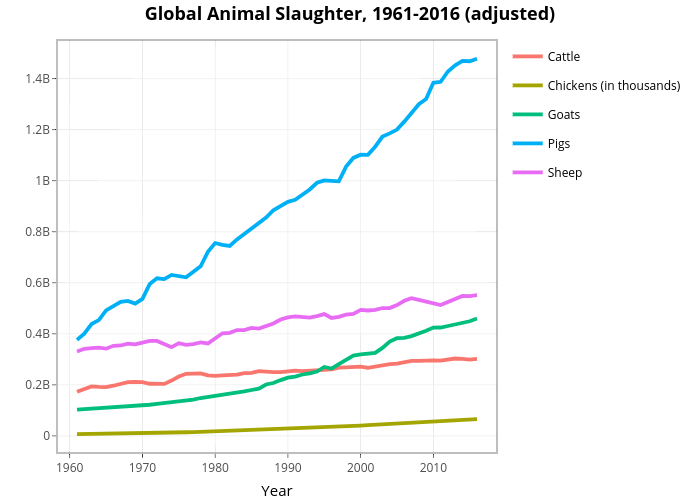 Taking that perspective, guest author Bas Sanders explores more than 50 years of animal slaughter trends. This series focuses on five main groups of farmed animals: cows, chickens, goats, pigs and sheep, based on data pulled from the Food and Agriculture Organization (FAO) of the United Nations. This post provides an overview of global animal slaughter. In the species-specific posts below, we explore the five animal types in depth. Their datasets can be found at the bottom of each page. 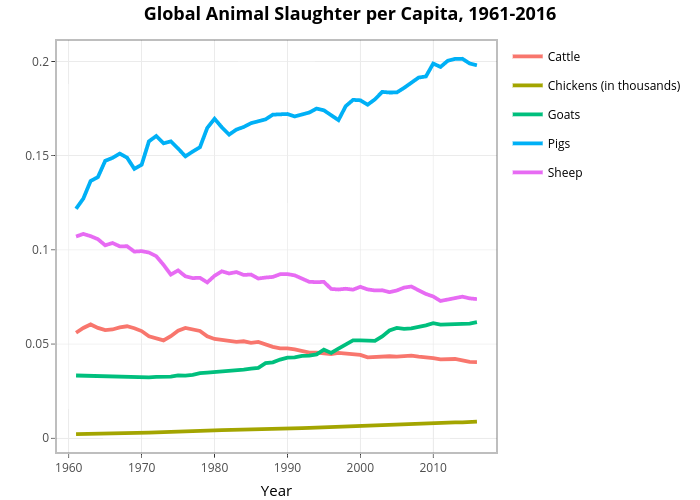 For our first look at the number of animals slaughtered worldwide, the interactive line chart below shows the 55-year trend (1961-2016) for the five animal groups mentioned earlier. Note that we have only included the five species mentioned previously. Obviously, the main story is that chickens are – by far – the most slaughtered land animal. The difference is so great that it makes the rest of the chart unreadable. In the updated chart below, we show chickens in thousands, which allows us to more easily analyze the results for other species. 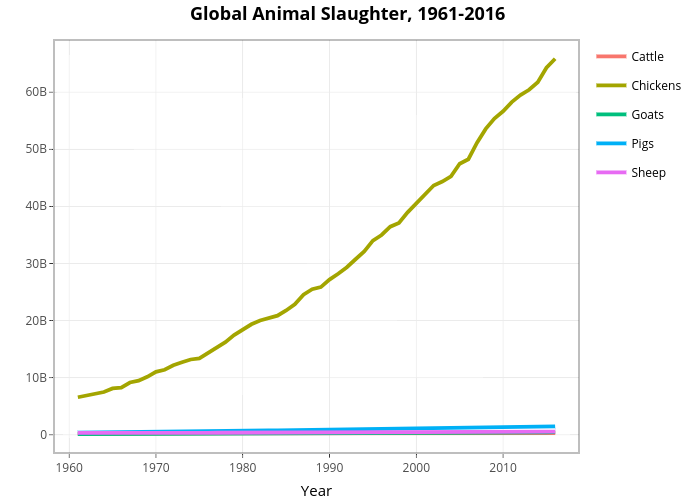 As the chart shows, in the period from 1961 to 2016 the number of slaughtered animals has increased for all the animal types. Again, most of the land animals slaughtered in 2016 were chickens. This was followed by pigs, sheep, goats, and cows. It is interesting to note that the number of slaughtered goats became larger than the number of slaughtered cows during the mid 1990s. The FAO data are for domestic “production” of farmed land animals and the question often comes up regarding imports and exports. One might suspect that the number of animals traded correlates with the number of animals slaughtered. 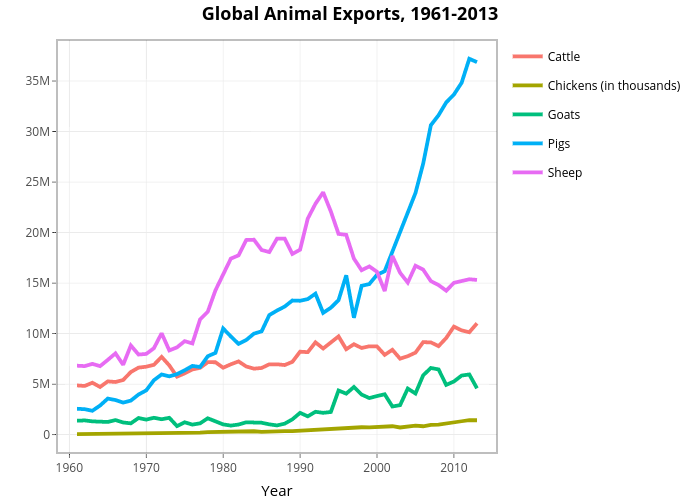 Below we plot the trend of the number of animals imported and exported in the world. Again, we display the number of slaughtered chickens in thousands to help with interpretation for other species. When one compares the slaughter charts with import and export charts (which are logically similar), we again see some evidence of a correlation between slaughter and trade. We examine this further for each of the six species in the articles linked below. Another question that often comes up relates to population. The number of land animals slaughtered differs widely by country, but so does the human population. The chart below shows animal slaughter per capita, again showing the number of slaughtered chickens in thousands. When we adjust for population size by looking at per capita data, it’s interesting to note that the number of cows and sheep slaughtered per person decreases over the years (even though the actual number of slaughtered animals increased). The number of pigs, goats, and chickens slaughtered increased over time.